Sponges can hold all kinds of germs and mold spores, so it’s a good idea to clean them often. 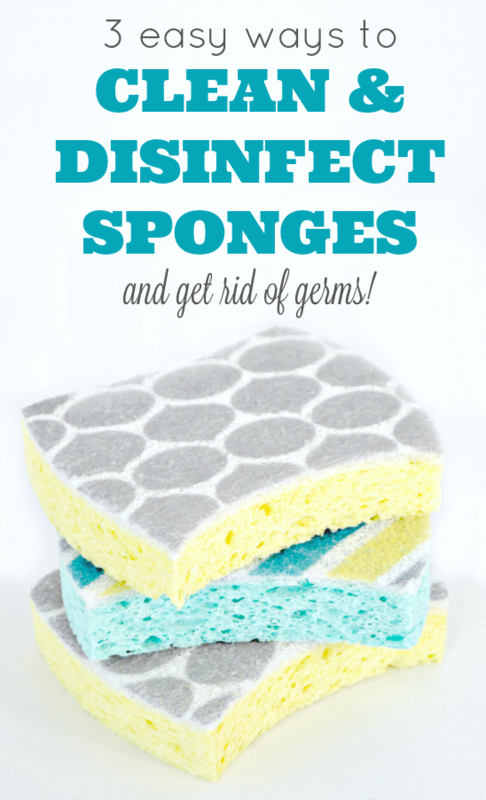 Today, I want to share 3 easy ways to clean and disinfect sponges and get rid of germs! Mix 3/4 cup of bleach in one gallon of water, and soak the sponge for five minutes. This will absolutely eliminate the germs in your sponges. In the microwave, saturate the sponge (I used 1/4 cup of water for scrub sponges and 1/2 cup for cellulose); heat on High for one minute (scrub) or two minutes (cellulose). Keep an eye on it.Put a sponge into a regular dishwasher load, using the “heated dry” setting. Put a sponge into a regular dishwasher load, using the “heated dry” setting. I put mine where the utensils go to keep them from bouncing around. This method should get rid of at least 99% of germs. Be sure to subscribe to my email list below if you haven’t already! I’m going to be sharing tons of homemade cleaning solutions, free printable labels for them and many cleaning tips and tricks! To see all of my cleaning solutions and home tips, check out my Home Tips Page, HERE! This is a great idea, I put my sponge in the sink almost daily and spray it (both sides) with Clorox Clean-Up or whatever I happen to have in my hand at the time. I hate to throw them out and there is NOTHING worse than that mildew smell they get. I have always soaked sponges in bleach water, then run them threw the dishwasher, my sponges smell and are clean. Taken care of, they last about 3 weeks in kitchen use. I never have an issues with the kitchen and bath sponges I wash them all the time after I used it take all the water out and let it dry. I have never have problem of smell or get mold on them! I rinse my sponge throughly after every use. Then I place it in the window so the sun hits it. This is the best way to eliminate odors and mildew.